In honor of St. Patrick’s Day, I figured what would be better than a POTATO with the colors of the Irish flag! I made mine with broccoli, scallions, and cheddar, so I could get the green, white and orange effect. I hope this brings a little St. Patrick’s Day spirit to your day! My better half is interviewing people this week, so it’s just me here until tomorrow. Cooking for 1 can be tricky, but I think this recipe fits the bill – It’s quick, easy, and I had all the ingredients on hand. The recipe is for 4 potatoes, but can easily be adapted to make just 1, or 8. I often forget how great a good baked potato can be. In college, my friend Christine, once had a “Baked Potato Party” in which she baked a bunch of potatoes, and then had all kinds of fun toppings for us to put on them. It was such an easy and creative idea, and I have been wanting to do it ever since – maybe this will inspire you to host your own. Whatever you put on your baked potato, it can be a hearty, and filling meal that’s easy and cheap to make. I also included some suggestions for alternate stuffed baked potatoes , which I am now dying to try! Preheat oven to 400°. Rub potatoes with a small amount of oil and sprinkle with salt. Place potatoes directly on rack and cook for 45-60 minutes. Do not wrap potatoes in foil because this will make the skins soft and it will be difficult to scoop the filling out later. In a large bowl combine 1/2 cup of cheddar cheese, sour cream, milk, garlic powder, broccoli, and 1/4 cup scallions. Remove potatoes from oven and let cool slightly. Cut the potatoes in half lengthwise. Using a soup spoon, scrape out as much potato as you can while leaving the skin intact – leaving about 1/8 inch. The potatoes taste better when there is less plain flesh left in them. Add the flesh to the large bowl with sour cream mixture. Mash the flesh until combined. Spoon the flesh back into the potato shells. Place filled shells on a baking sheet coated with aluminum foil. Sprinkle remaining cheddar cheese over the tops of the potatoes. 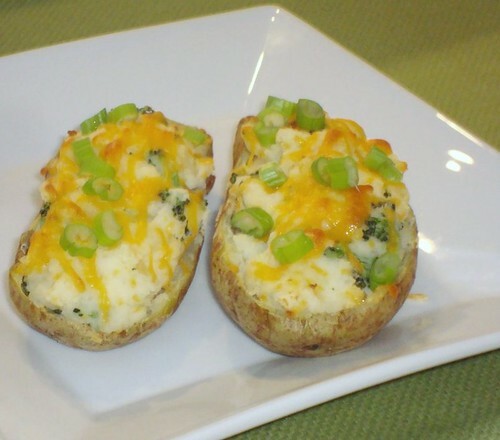 Return potatoes to the oven for 10-15 minutes or until cheese is melted and starting to brown. To serve, top with remaining scallions. Substitute 1 cup crumbled blue cheese for the cheddar, and 1 cup sautéed mushrooms and onions for the broccoli. Substitute 1 cup of herbed goat cheese for the cheddar, and 3/4 cup caramelized onions for the broccoli. This entry was posted on March 17, 2011 by Spice Is Nice. It was filed under Easy Weeknight Dinners, Main Dish, Side Dish, Vegetarian . What a creative idea!!! I have class tonight – and I already have all the ingredients to make this – so this will a GREAT Irish Linner 🙂 You are so fun! !